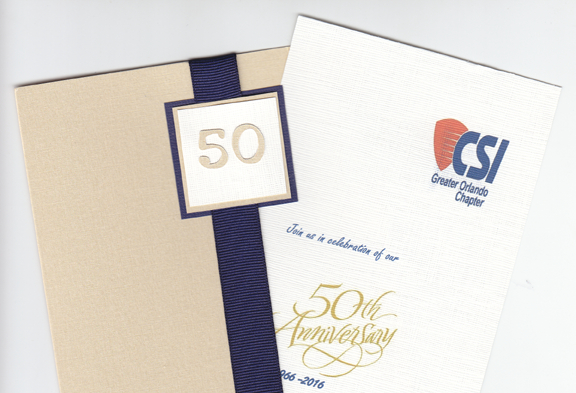 “CSI was founded in March 1948 by the specification writers of government agencies who came together to improve the quality of construction specifications. The Institute’s efforts were essential in improving construction specification quality so that it could meet the demands of the post-war construction boom. Development of specifications best practices, promulgating standards/formats, professional education, and certification were cornerstones of the Institute. I was honored to serve as chapter president during the 2008 year when we hosted the Southeast Region Annual Convention in Orlando at the Grand Bohemian Hotel downtown. And despite the hovering Hurricane Fay stalled off our shoreline for all 3 days, we had a great event. On June the 3rd they will celebrate this great milestone in the life of their chapter at the Orange County History Center at 6 PM. At the link below you can RSVP to join us in toasting the success of the GO CSI Chapter, with most of their past presidents in attendance. Our sincere congratulations on 50 years!! And below is a link to the GO CSI chapter website for more information about them and the CSI institute. This entry was posted in Events and tagged Anniversaries, GO CSI, Orlando. Bookmark the permalink. Congratulations to all serving the AIA to make it the organization it has become. AIA Orlando is excited to be the host chapter for the 2017 AIA Convention! The Orlando area offers a vibrant diversity of architecture (from Frank Lloyd Wright, Bauhaus to Calatrava), has a vibrant arts community, an innovative technology and simulation industry, and is a leading hub for healthcare. Join us for the 2017 AIA National Convention at the Orange County Convention Center.